The Daewoo KOG3000SL Grill Microwave offers 20 Litres capacity and 800w of power, complete with 10 power settings, as well as a 1050W built in grill. Read on for our review. Good value, and functional - the controls are easy to use. On bright days the display can be a little hard to read - asides from that it's fine. 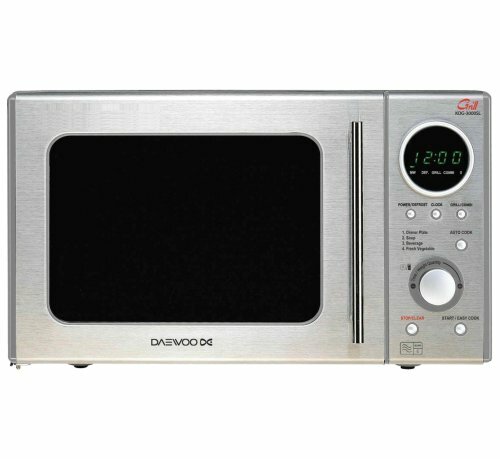 Built in stainless steel, and offering a grill facility, the Daewoo KOG3000SL Microwave provides several practical and handy features for it's retail price of around £80.00. Daewoo have clearly put a great deal of thought into both the overall design and the functions of this kitchen appliance - it looks modern, yet would suit most kitchens, regardless of their style or colour scheme. The exterior is finished in a stainless finish - with clear and easy to use controls. Bright sunlight may make it slightly difficult to view the timer, but apart from that we had no issues whatsoever. Firstly, in terms of power, it's microwave facility provides 800W, with 10 different power levels from defrost to high. The included auto cook menus make simple tasks even easier, and the child safety feature helps to prevent small hands from causing accidents and injuries. The Grill facility provides an impressive 1050W of power, enabling you to cook foods previously not possible in a standard solo silver microwave, and overall the build quality of this appliance feels good. In terms of size it measures 27.9cm by 46.5cm by 38.2cm and weighs around 11.8kg on our scales. One slight criticism is that we have heard reports of some of this range having broken turntables - however we did not experience this during our rather thorough test period. So overall what did we make of the KOG3000SL? If you're looking for a decent value microwave oven, that looks attractive, and will provide years of service, then this offering from Daewoo is a good shout. Is this microwave easy to use? I want one for my elderly mother who struggles to use complicated technology.